Day 1 went well, all things considered. We got into the building, had all the materials we needed, everybody showed up, and nobody fell asleep. We survived. Day 2, we’re bringing lots of ice water and sunblock. It’s all outdoors and the forecast calls for 92°F weather. There’s a heat advisory. We’re setting up a tent for shade in the parking lot where we’re doing the drills. I’m glad we made on-road so short. Cheerfully pleasing God is the main thing, and that’s what we aim to do, regardless of our conditions. Here’s part of a renewal notice email I received today — July 27, 2010 — from the League of American Bicyclists. I’d better get right on this renewal — I only have a little over 12 months! In other news, I saw a mother raccoon furtively ushering her brood of partly-grown kits (?) into some bushes on Mercer Island this morning. She gave me a belligerent, “Don’t mess with me” stare. I didn’t mess with her. But I have had God’s help to this very day, and so I stand here and testify to small and great alike. Clean our bedroom and bathroom. Go for walks and hikes. Go somewhere to take pretty pictures. Those are just a few of the things I look forward to doing in the time I hope to keep free in the future. Ian and I will be gaining possession of a house almost exactly 1 month from today (!! ), but between now and then I intend to use my weekends to RELAX as much as possible. Yesterday, though not overly relaxing, actually went incredibly well. I rode to Cascade that morning, met up with Ellen, found an empty parking lot, set up the Avoidance Weave course, and returned to gather the students. Then we rode to the parking lot, practicing turning left a few times along the way, and did the Avoidance Weave, the Rock Dodge, and the Quick Stop. I demonstrated (badly) the Instant Turn, and we gave people the opportunity to try it themselves — and all but one wanted to. We had to take the course down to stop them from riding through it, they were having so much fun. I didn’t have a chance to see the student evaluations before Ian picked me up, but I came away feeling like I’d done a decent job, especially for my first-ever major class like that. I also ended up thinking that I would probably find teaching bike classes much more enjoyable than my first experience indicated. So, in a nutshell: Pretty good experience for me; I’d probably be willing to do it again, but not any time soon. It’s still a ton of work and time, and that’s what I’m short of these days. Yesterday I co-taught the first half of my first-ever Traffic Skills 101 class. Cascade Bicycle Club calls it Urban Cycling Techniques. To prepare, I diligently reviewed the materials I received during my instructor training and last weekend I practiced the bike handling skills we’d teach this weekend. Not that I didn’t need to do all that; the review did help keep the material fresh in my mind. But my co-teacher, Ellen Aagaard, runs such a laid-back, easygoing class that if I needed to refer to my notes or the book, that wasn’t really a problem. I liked how Ellen ran the class as a discussion, soliciting most of the information and ideas from the students. I’ve learned quite a bit having watched her interaction with the students. She listens respectfully and makes it clear that the students’ ideas are very important. The class ran over by an hour (! ), and a couple people had to leave before then, but everybody stayed engaged and interested, even though it was after lunch and the after-lunch sleepies set in. Yesterday we spent most of the day in the classroom. After introductions where students talked about their experience and what they want to get from the class, we talked about bike fit and parts of the bike. Then we moved outside to do the ABC Quick Check (despite having said to bring “a bike in working order that you’re familiar with,” people brought bikes they’d just bought the week before, bikes with brakes so badly damaged as to require replacing, etc. I suspect this is normal). Because some of the students’ bikes required adjusting or quick fixes, we split up: Ellen took care of those little emergencies, and I led the rest of the class to the parking lot, set up the course, and started going over starting and stopping. Unfortunately, the parking lot we agreed to meet at happened to also have a marching band practicing there — something Ellen had never had happen before. Once Ellen and the rest of the class met up with us, we picked up the course and moved to another parking lot farther away from the marching band. This weekend also happens to be the annual FlorAbundance plant sale for the Arboretum Foundation, which means that there’s a lot more traffic and a lot fewer open parking lots than usual at Magnuson Park. That aside, we found a parking lot that was sparsely populated enough that I only had to kick one driver out. He parked in the middle of the course. I felt that Ellen and I worked together really well particularly outside; while she instructed, I set up; then while I demonstrated and led off the practice, she observed the students’ technique. I think we kept dead time to a minimum, although setting up/taking down the course and transitions did kill more time than I would like. On the way back, one of the students dropped her chain as we rode up a little hill, so I stopped with her and we talked about why chains fall off and how to shift. Then we walked back down the hill and rode up again, this time in the right gear. The student was amazed at how much easier it was to ride up a hill in the right gear. She’s an urban planner doing pedestrian and bike infrastructure, but had hardly ridden a bike in all these years. I hope the class gives her a different perspective on riding and what infrastructure supports safe cycling. Today we’re doing the avoidance techniques — the avoidance weave, the rock dodge, and the quick stop; instant turn is off the menu, since these are such new, shaky students — followed by an in-classroom discussion of what causes crashes and crash avoidance, and then the road ride, where students practice everything they learned. At least, that’s the plan. As I learned yesterday, anything could happen. We’ll be flexible and make sure the students get the most out of it, no matter what we do. The weather calls for partly sunny skies, light winds, and temperatures around 60°F, but right now it’s 47°F and quite cloudy. I may wear my jacket just in case. All in all, yesterday was a wonderful redeeming experience after the fateful LCI Seminar I helped co-teach back in February, and it makes me think that maybe I do want to teach more of these classes now and then. It’s 10:41 and I’m not at work yet. This is very strange, but nice: I’ve gotten all sorts of things done that I don’t have energy to do at the end of the day. I got up and shaved my legs (feeling the breeze in my leg hair as I ride isn’t an experience I anticipate eagerly), washed some dishes, washed the sheets and remade the bed, cleaned the bathroom thoroughly, and made two loaves of chocolate chip banana nut bread. Generally these chores don’t bother me, but most workdays I arrive home so worn out that I can’t summon any more energy to actually do them. Now I’m thinking about doing some basic, routine bike maintenance — re-lubing my bike chain, wiping my gorgeous pink fenders down, and pumping up the tires. By the way, if you own a bike and don’t ride it very often, there’s a quick once-over you should do before riding. It’s called the ABC Quick Check. A is for Air. Check the pressure in your tires with a gauge or by pressing with your thumb if you know how it should feel. 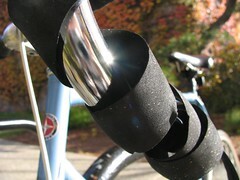 Add more air at least every week if you ride frequently. B is for Brakes. Squeeze the brake levers. You should be able to fit your thumb between the handlebars and the levers when they’re braking all the way. Another brake check is to squeeze the front brake lever all the way and rock your bike forward so the back wheel comes off the ground; then squeeze the rear brake lever all the way and drag the bike forward so it skids a little bit. That confirms your brakes are working. C is for Crank, Chain, Chainrings, and Cassette. Basically this is the entire drive-train of the bicycle. Back-pedal the bike and listen/watch the chain as it goes around, monitoring for any odd noises. This checks the cassette and chainrings. Rub the chain: Your fingers should come away clean. Keep the chain metal-colored, not black or rusty. Finally, grab the cranks and try to wobble them away from the bike a little bit. They should be firm and not go side-to-side at all. Quick is for Quick Releases. Check the quick releases on your wheels, brakes, and, if you have it, on the seat post. A correctly adjusted quick release should point away from your direction of travel and, when you close it, should leave a white imprint on your palm but not be agonizingly difficult to open or close. Check is for…Check. Lift your bike no more than 6″ from the ground and drop it (gently). Listen for any unexpected clanks or rattles. Checking also involves going for a short ride before taking off to shift through the gears and do a general check to confirm it feels right as you ride. Whew. Now that I have that LCI-inspired material off my chest, we can get back to my regularly scheduled blog. Unfortunately, the flip side of still being here that at 10:40 tonight I probably won’t have gotten home yet from the tabling event I’m helping with in Tacoma. Also having a shifted work day today means tomorrow and Friday will also get totally thrown off. I also have about 6 hours to make up for the day I took off when Grandma Sullivan was in the hospital last week, and the AmeriCorps time sheet system continues to confuse the heck out of me. I’m just trying to make sure I get in 8 hours every day or 40 hours for the week, and then sort out the rest later. That’s harder than it seems, since nearly every week some unusual event comes up and requires me to put in some strange hours. Charles River and its regular 8:30 to 4:30 my internship ain’t — and I’m really OK with that. The weekend, and my two last-minute presentations is — are — auughh, no parallel structure…! — over! Truly, my weekend activities have sunk to a new low indeed when I start looking forward to Monday. Over the course of the weekend, I kept a list of things the LCI Coach did that I disliked. I planned on writing a long letter to Preston Tyree, the Education Director at the League of American Bicyclists, about how incompetent I thought the LCI Coach was. I even thought about posting my irate correspondence here on my blog as an open letter. Fortunately, some small, socially adept voice inside me (it’s very small) told me that even if I decided to write a letter to Preston, posting said letter here would probably not help anything. “Is it kind? Is it helpful? Is it loving?” kept echoing through my head, and I had to admit, “No, no, and…no.” Ah well. Besides, I finished the weekend intact, if frustrated and disgruntled, but in one piece. Better yet, the LCI Coach said that he would report back to Preston that I should be upgraded from LCI-in-Training, which is the designation I got upon completing my seminar in October, to a fully-qualified League Cycling Instructor. That means I can teach classes on my own if I want to. Even though I may come out of this weekend as a full LCI, I’m not sure it was worth it. One way to tell would be to do a pros/cons list. Practice guiding students on the road – very helpful and confidence-building for when I actually teach on my own. Review LAB curriculum and “procedures” (if the random smattering of activities associated with classes could be considered such). Meet a dozen nice Seattle-area cyclists. Build relationship with Cascade Bicycle Club. Maybe become fully qualified LCI, if he remembers to contact Preston. Work with this particular LCI Coach. No sleeping in any day all weekend — I woke up at 5:30 and had to not only get rolling immediately, but pack lunch, snacks, dinner, and clothes both days. Longer-than-8-hour-days Friday, Saturday, and Sunday. Missing most of the warmest, sunniest weekend yet. The stress of creating presentations at truly the last minute. No opportunity to spend time some QT with Ian or to make some delicious yeast bread, both of which I try to do on a weekly basis at least. No long rest for my legs. Monday feels like the middle of the week. Generally high stress levels the entire week before, and during the event. I can’t count any of those 20+ hours towards my internship at all, even though me being an LCI is very beneficial for the Bicycle Alliance. And, of course, working with this particular LCI Coach. I have to say that, in summary, it was probably not a wise decision to agree to assist this weekend. I did get some benefits from it, but the costs far outweighed those benefits. And alas, finishing the weekend only meant starting the week — a week that, as usual, is stuffed to the gills with AmeriCorps and internship-related activities, so there’s no real break in sight.